Jarlath O’Neil-Dunne, Geospatial Analasyt at the UVM Spatial Analysis Lab will present this free webinar. In essence, Map Algebra is the underlying language for Spatial Analyst tools and operators. This workshop will demonstrate simple and effective techniques for processing raster datasets in ArcGIS within the Raster Calculator using Map Algebra expressions. This workshop is designed for ArcGIS users who are familiar with raster data, but don’t have much experience with either Map Algebra or the Raster Calculator. Demonstrations will be done using both ArcGIS 9.3 and ArcGIS 10, and key changes to Map Algebra and the Raster Calculator at version 10 will be covered. VCGI has made some changes to our Cached Map Service offering. We’ve added a cache for Vermont’s black and white orthos in Web Mercator, which will allow you to create mashups with Bing and Google using VT’s orthos. We also corrected the projection problem with the color Web Mercator cache (Note: The last zoom level hasn’t been fully cached yet, but the bulk of the cache is usable). This is still a BETA offering, so please keep that in mind. Your feedback is always welcome. EnvironOther_BIOMASS – Algae, food waste, grasses, methane, oilseed crops, wood. EnvironOther_GEOTHERMAL – Potential open and closed loop geothermal sites. EcologicOther_RTENATCOM – Rare, Threatened and Endangered Species & Significant Comm. As a way to help new or casual users of TransRoad_RDS, we have developed two layer files to help jumpstart a user’s ability to meaningfully display the road centerline data. These layer files will be included as part of the zipped Transroad_RDS data package available from VCGI. I’ve also attached them to this email in case you have already downloaded the data before the layer files were available. As suggested by their names, one is based on the data contained in the field AOTCLASS, and one is based on the AOTCLASS and SURFACE fields. At this point, you should be back in the Layer Properties window with the new symbology assigned so click OK to accept the symbology and return to the map. At first, the map request from the Wilmington Planning Commission seemed challenging enough: create a map that would clearly show all six different land use districts, two additional overlay districts, source protection areas, deer wintering areas, wetlands, floodplains, scenic roads, contours, and so on. Designing a single map that displays all these features with distinctly different symbols and colors is not a simple task. Then the planning commission added one more requirement: make the map so that one of their members, who is color blind, could read it. Designing this map now seemed all but impossible. About five percent of people have some sort of color vision deficiency, and ten percent of all males are at least partially color blind. Most color blindness results in a person’s inability to distinguish between some shades and red and green. If you’re a GIS person, chances are at some point you have made a map that someone had trouble reading. At ColorBrewer, you can test all sorts of color schemes using hypothetical data and see how they would look on a map. The site developers have created schemes that are “friendly” to color blind people, photocopiers, LCD projectors, and more. Color schemes with up to nine legend classes (i.e. nine different colors) can be tested. The fewer the number of legend classes, the more color blind friendly schemes are available. Hue, saturation, and value figures for each color in the scheme are provided, and these numbers can be used in ArcView 3.x’s legend editor to reproduce the colors (click on the ‘custom’ button in the color palette window where these values can be entered). The Vischeck website (www.Vischeck.com) provides some background information about color blindness. Perhaps more importantly, however, the site offers a utility where you can load an image file (such as one of a map you’ve produced) and Vischeck simulates what your image would look like to a color blind person. Armed with these two tools, I set out to produce a map that would prove to useful in conveying information to all members of the planning commission. I first developed a legend for my map using a color scheme from ColorBrewer. I then created a JPEG image file of the legend and ran it through Vischeck (small files sizes work best in Vischeck; hence the JPEG of the map legend and not of the entire map itself). Oddly, the results from Vischeck showed several of the ColorBrewer colors, particularly the red and green, would appear similar to a color blind person. Plus the map, to my non-color deficient eyes at least, wasn’t the most visually appealing piece of cartography; the colors were simply too stark. To correct these shortcomings, I went through several iterations of tweaking the ColorBrewer scheme and running it through Vischeck. Omitting several of the confusing colors (retaining the softer colors that looked good together) and instead employing some cross-hatch patterns for a few of the features also helped. The goal was to make the colors more visually appealing to people without color blindness and at the same time more distinguishable to a person with color blindness. For a final check, I ran a JPEG image file of a small portion of the actual map through Vischeck. 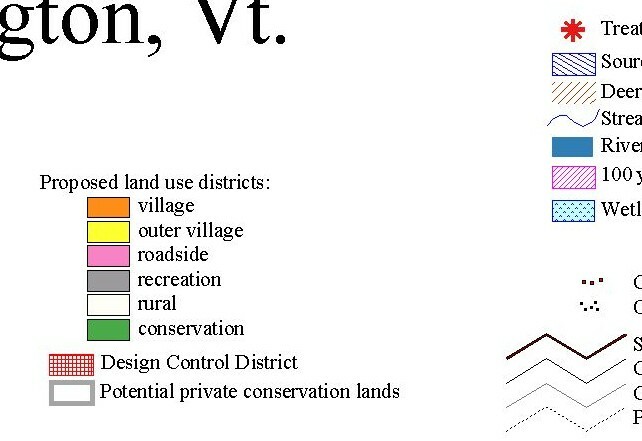 In the end, I was able to produce a map that didn’t make me nauseous, had distinguishable colors and symbols according to Vischeck, and was “perfect” according to the planning commission member with color blindness. Description: Spatial data editing has never been easier, or more flexible, than it is at ArcGIS 10. ArcGIS Desktop features a new template-based editing environment to streamline workflows. 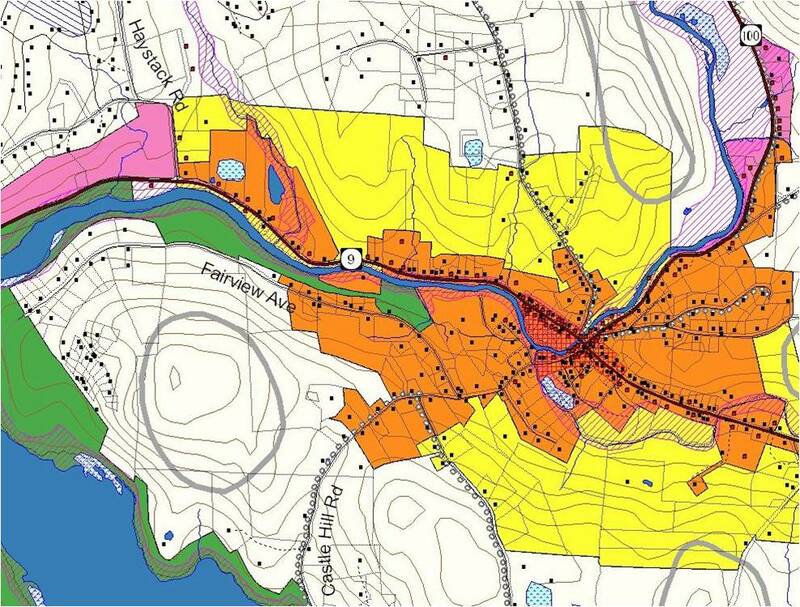 New edit tools, procedures, and geoprocessing capabilities will be showcased, as well as a new method of storing and editing land parcel data. Demonstration and discussion as to how ArcGIS Mobile and ArcGIS Server applications can also use the new editing templates to edit spatial data will also be covered. You are currently browsing the VCGI's Blog blog archives for November, 2010.